I'll run the risk of spoiling the ending; the king does do a great job with his speech. And even before you start the movie, you are well aware of this historical inevitability. However in the long and torturous path, leading the man with a stutter to the kingship of World War 2 England, lies a fascinating story of friendship, bravery and self-realization. Such is the story of King George VI, who came to the throne after the death of his father and abdication by his brother. 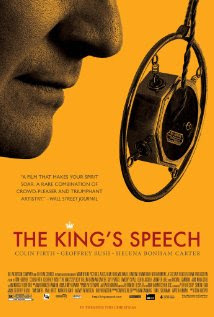 The King's Speech is an account of one man's struggle with his own daemons, and the story of a reluctant king's rise to power during a time of incredible trial. Colin Firth is unbelievable as the King. There is little that can be said about his performance, that hasn't been said before. He was almost perfect struggling to put his thoughts into words, and the abject, stifling fear that public speaking or even attention brought upon his person can only be seen to be believed. The screenplay focuses exclusively on the speech impediment, often juxtaposed with an account of the personality of the Duke and ultimately the King. Almost too exclusively. By design this lends a one-dimensional aspect to the film, which is not necessarily a bad thing, but it unfortunately paints the man with just that one stroke. As a result the emotional drama is significantly emphasized over historical context, which again may not be a bad thing. Because this makes the movie appealing at a very personal context without the distraction of accuracy. Which brings us to the speech therapist. Lionel Logue (Geoffrey Rush) is the enigmatic man that is as important a character in the story. Rush is positively inspired as the Australian man who developed his techniques assisting shell-shocked soldiers during the first World War. Peculiar, patient, amusing and irreverent, he makes you wish you had a teacher like that. For a movie that did not care about historical storytelling there are several choices that were surprising. The one that stood out the most was casting and actually showing a Churchill on screen. Arguably one of the most well-known faces, casting Churchill is a challenge. Timothy Spall was a surprisingly good pick. Even if he did not look like Churchill, he definitely was not distracting by not feeling like Churchill. The king's wife, Queen Elizabeth (Helena Bonham Carter) was probably more cliched than most, as the strong yet supportive royalty. In a way she was the royal standard that measured the lack of congruence among the rest of the relationships. The movie is a fascinating look at the pressures of expectation. That the pressures were for, arguably, the most important job in the world is only incidental. The movie is an emotional journey with travails and triumph. But at the core, it is a simple feel-good story that is both poignant and inspiring.